When German Chancellor Angela Merkel meets with POTUS today, one topic that’s most likely going to be addressed is the trade deficit between the United States and the EU, Germany in particular. The Spiegel, a major German news outlet, has illustrated recent articles on this subject with the figure below. 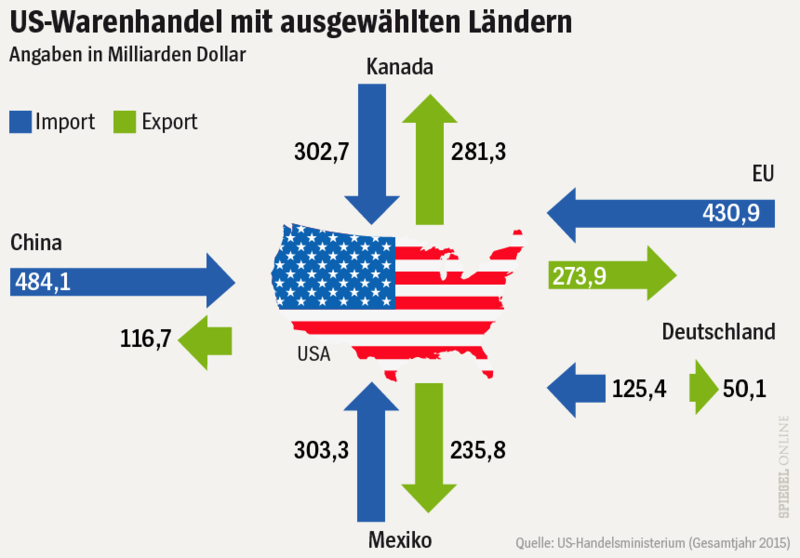 It shows the volume of trade between the United States and ‘selected countries’ (China, Canada, Mexico and the EU) in 2015. The values indicate the value of goods exported (green arrows) to these countries, and imported (blue) from them into the U.S. in billion US$. The interesting thing in this infographic is that the length of the arrows represents the value of goods traded. For example, the arrow for exports from the US to Europe (274 bnUS$ in 2015) is little over half the length of the blue incoming arrow (431 bnUS$ in 2015). This works fine, with the only exception being the green arrow for exports to Mexico. This infographic of course invited a remake as Sankey diagram. As you all know, in Sankey diagrams the widths of the arrows represent the quantity. I did two or three different versions, all very similar to the original infographic in style and color, even using the lower states map icon (sorry Alaska and Hawaii). I was not sure at first whether the separate arrows for Germany were values already included in the EU trade volume, or if they were meant to be on top of it. A quick look into the original data revealed that indeed they are included in the EU figures already. I therefore decided to highlight the German share in the Sankey diagram with a slightly brighter color, but keep those arrows stacked. 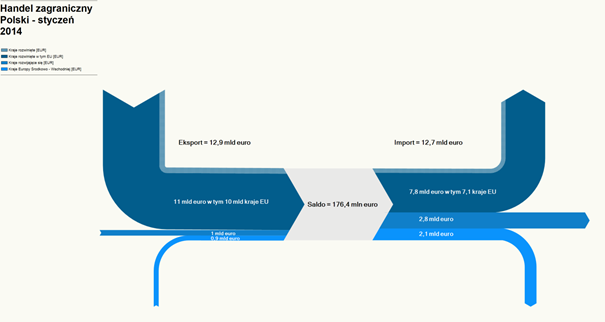 Here is my Sankey diagram version of the Spiegel infographic. Not sure which version I prefer, but using the length instead the widths of the arrows to represent the flow quantity is definitely a unique approach. Worth sharing with you, I think. Comments Off on US Trade Balance, two versions	Tags: Europe, trade, U.S.
Another Figure from OECD/IEA World Energy Outlook 2014 report showing energy exports/imports from/to five African subregions. Coal measured in million tonnes of oil equivalents (mtoe), oil itself shonw in millions of marrels per day (mb/d). Natural gas measured in “bcm” (anyone?). Taking it easy with a casual Friday post. 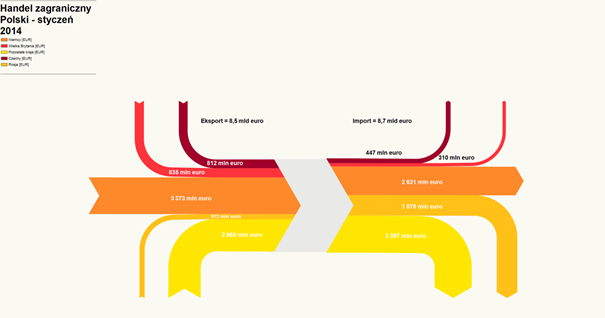 This Sankey diagram shows the world wide gold supply and demand in 2013. This is from a post in the e!Sankey forum and available as sample file in their new release. Data is from the ‘Thomson Reuters Gold Survey’. 4,736 tons of gold were traded that year with roughly 3,000 tons production from gold mines. Largest demand was from jewelry makers (2,198 tons) followed by people who purchased gold bars (1,337 tons). Drawing Sankey diagrams on a world map to show flows between different geographical location is always a challenge. One of the inherent problems is that large (=broad) arrows may run between two points on the map located very close to each other. Another problem is that one wishes to have the arrows more or less along the actual trade routes, which in many cases is close to impossible (take, for example, ships going through the Panama or the Suez canal). I have shown quite a number of ‘Sankey diagram maps’ here on the blog, but most of them had shortcomings. Now here is an example that does extremely well in tackling the issue of Sankey diagram flows on a world map. 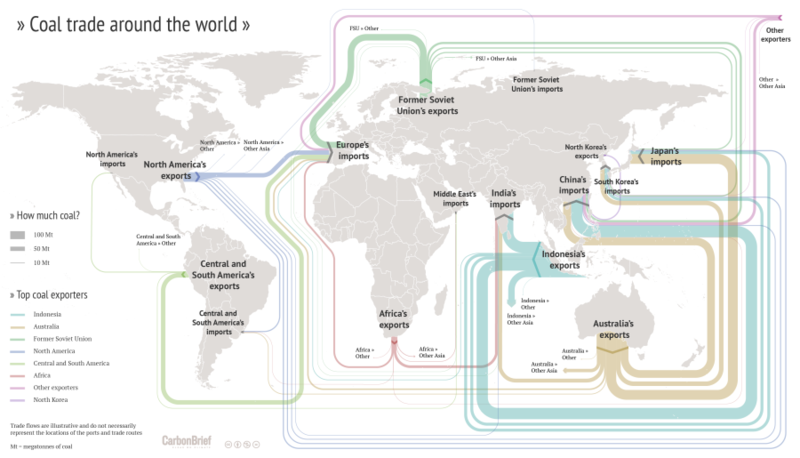 This flow map of coal exports around the world shows the top exporters. It was crafted by Rosamund Pearce for the Carbon Brief article “Mapped: The global coal trade”. She decided to route the Sankey arrows nicely sorted, in parallel, and not along the actual shipping paths. See how much of the coal trade from Indonesia to China is led “virtually” south of Australia and New Zealand? Additionally the arrows are not led precisely to the actual port, but rather connect at a suitable place of each continent. 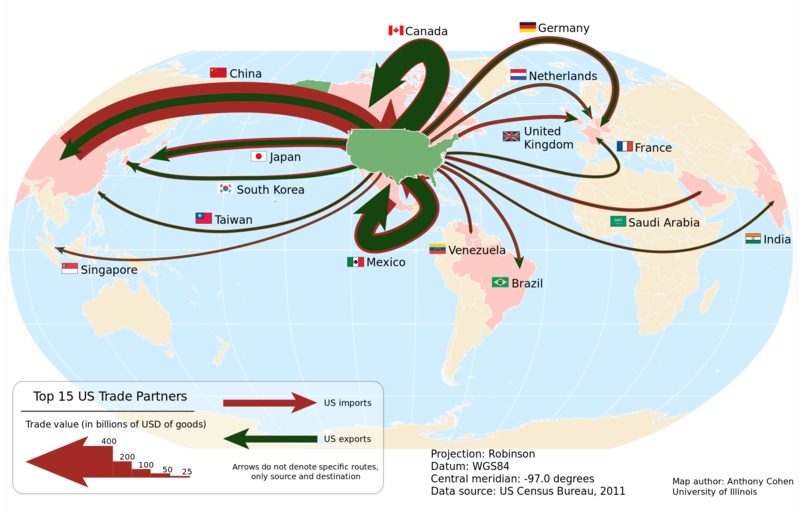 With these simplifications the trade flow map is much clearer, understandable. Another world coal flow diagram from 2012 can be found here. The ‘Blog Audytorów Sledczych’ had two interesting Sankey-style diagrams. The first is the trade balance of Poland for the month January 2014. Flows are in Euro (trade volume). There is a trade surplus of 176,4 million Euros. Unfortunately only the legend shows what the arrow colors mean, but it is not legible in this screenshot. The second one focuses on the five main trade partners of Poland. Here the value of imported goods is higher (8,7 billion Euro) than the value of exported goods (8,5 billion Euro). Again the legend is somewhat difficult to decipher, but we can see Germany, Czech Republic, UK and Russia. 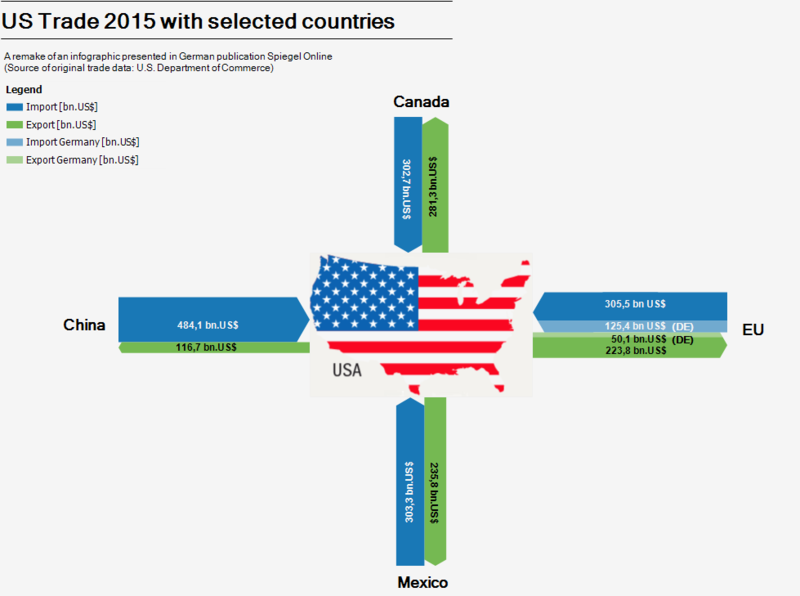 Largest trade partner (both regaring import and export) is Germany (large orange arrows). Trade imbalance is visually barely noticeable, just by a slight step when looking at the incoming and outgoing arrows. The 2012 GEA Global Energy Assessment report (GEA Global Energy Assessment – Toward a Sustainable Future, Cambridge University Press, Cambridge UK and New York, NY, USA and the International Institute for Applied Systems Analysis, Laxenburg, Austria) features five maps showing energy trade in the world on pages 128/129. These can almost be considered Sankey diagrams, so I am featuring them here on the blog. This one is for embodied energy in trade goods. Blog reader Panalion sent me a photo taken in Amsterdam’s Botanical Garden. It is of a map showing coffee and tea flows from producing countries to mainly Europe and North America. Panalion writes “I thought you might like this Sankey map I found attached to a cable between two palm trees. There were chairs set up to accomodate school classes”. This map is for didactic purposes and features no absolute figures and no year. 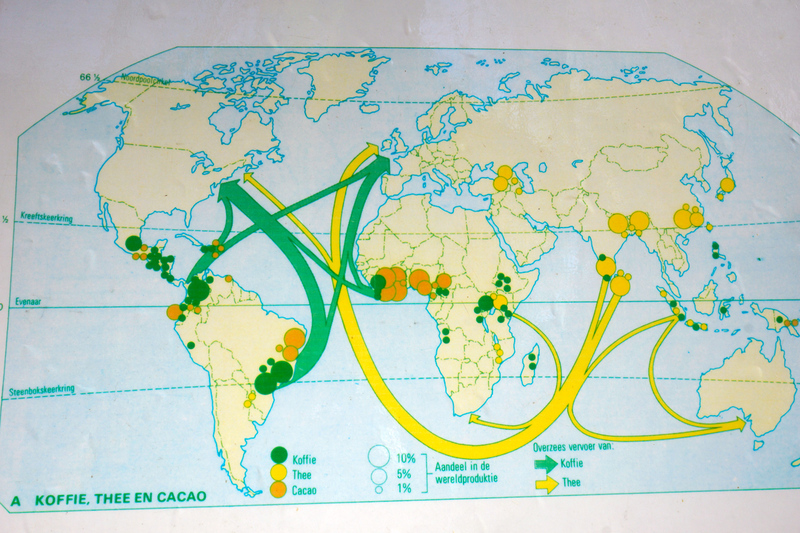 In addition to the export flows of coffee and tea shown as arrows the map also has circles of three different sizes representing percentage of world production of coffee, tea and cocoa in the originating country. Infographers might have better ways of showing this information. But in this case I think it is sufficient to get the message across to the target audience, the school kids.